The “Gold” captive-bred form of Puntius denisonii is now available in larger numbers and should be commercially available soon. 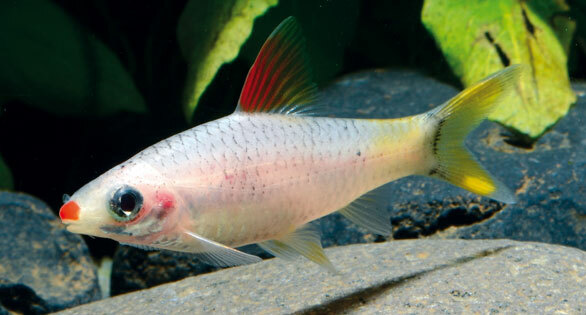 An Indian endemic fish admired by many for its sleek elegance and shoaling behaviors in larger aquariums, the Redline Torpedo Barb, Puntius denisonii, may be overfished and endangered in its native waters, but captive-bred specimens are reported to be gaining ground and in new varieties. AMAZONAS Editor Hans-Georg Evers has recently photographed several farmed morphs of P. denisonii at Maju Aquarium on Java, Indonesia, where it is being aquacultured in large numbers. 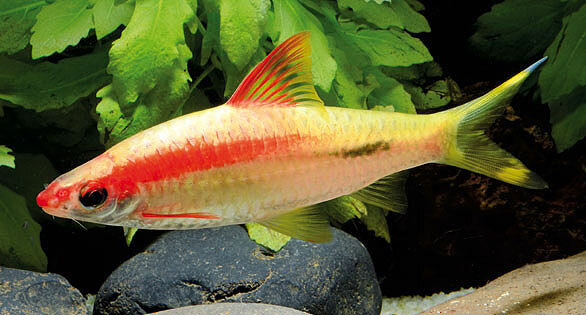 Standard Redline Torpedo Barbs, classicly sleek fish now being aquacultured in large numbers as wild stocks are depleted. 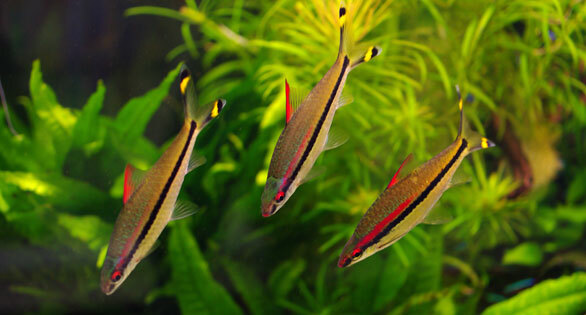 Readers may recall that the March/April 2013 of AMAZONAS presented a golden form of the Torpedo Barb. This mutant appeared among tankraised offspring in Indonesia and caused quite a stir in the trade and among barb enthusiasts. It is believed that a the widespread distribution of this attractive form will establish it as a popular choice for aquarists worldwide. During a subsequent visit to Maju Aquarium, Hans says he had the opportunity to photograph two new Torpedo Barb color morphs. “Lipstick” form of the so-called Miss Karala Barb, Puntius denisonii. In India, the species is known as “Miss Kerala”, in reference to the distribution area. Says Hans: “Now Miss Kerala wears lipstick, but so far, only a few specimens can be called ‘Lipstick.’ With a white base color, these animals show a red dot at the tip of the snout, a red dorsal fin, and a yellow caudal. 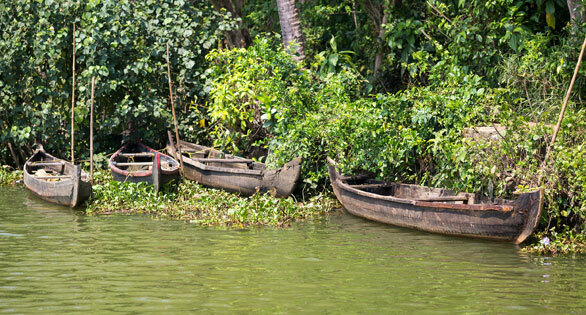 Backwater stream in the state of Kerala, India, home to the Redline Torpedo Barbs and other endemic aquarium species. “Gold” and “Lipstick” forms of Puntius denisonii: Hans-Georg Evers/AMAZONAS Magazine.